I've been five times to London, lately. All the times the weather was a little Siberia for me (I am used to a warm Dubai's weather already). I met a blogger friend ones and I thought to impress her, so I was wearing my coat only over my sholders. I end up caughing all night after. Not for me this weather, slightly over sholders wearing coat, bare feet in balerinas, etc. :D :D :D. Well, I don't mean to change the trends but I will be honest, I will go for mens sana in corpore sano, at least for winter time :D So, I have fully buttoned up my coat, pulled on the tartan scarf, put on the kitty ears hat and the best gloves for this iponesation era on my latest trip to RainyLand. 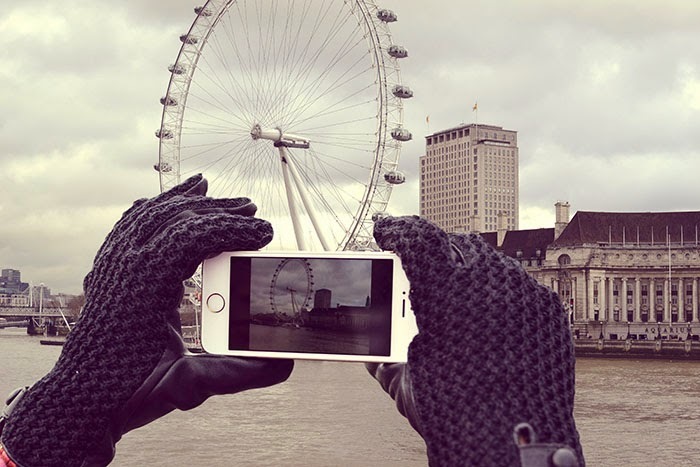 These MUJJO touchscreen gloves are miraculous for me. First they are made off leather (that is a must for me when is about shoes and gloves) Duch designer lebal, then they are touchscreeeeeeeeeen!!! For a photo maniac like me this is a salvation. I don't need to take the gloves off each time (min 100 time per day) I want to take a picture anymore. Molto belli e utili! !troppa invidia che sei a Londra!! WOw, these must be the most fashionable touch screen gloves ever! Molto belli e molto utili, ciao! Those gloves are just too cool,lurv it! I want one. Love your pink coat and you look so sweet. I wish I could have known about these before I got to NYC - would definitely have used them! you look lovely! great gloves! Your picture looks gorgeous, and for some touching srean gloves they looks cute, it really surprise me!!! Beautiful photos! My sister was also in London at the weekend. Que fotos más bonitas, me gusta mucho el abrigo rosa!! Thks for sharing with us this post! I didn't know about this brand!